Ingenuity, creativity and sustainability combine in Foundry, our Small Business of the Month. 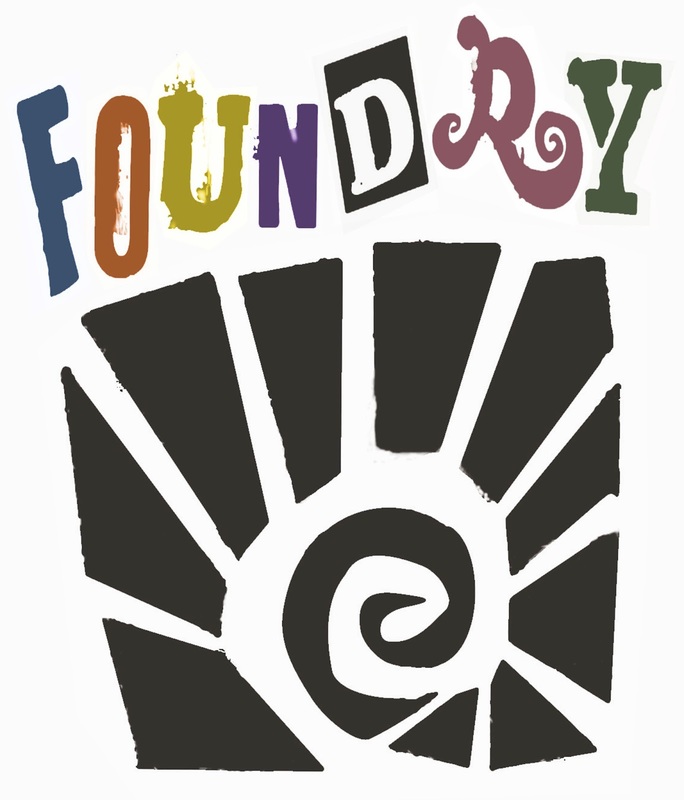 The Asheville Chamber is pleased recognize Foundry as a small business lending a creative and innovative flare to the Asheville community. 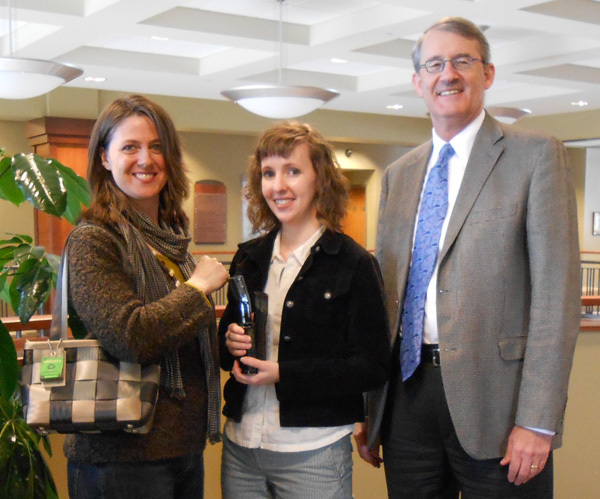 recycled materials (with Chamber Board member Dana Stonestreet). Located at 92 Charlotte Street, Foundry is a shop/gallery co-owned by Shelly Piper and Natalie Hood focusing on handcrafted items made from recycled materials. "We both have been so impressed and inspired by the ingenuity found within the practice of reuse, that at Foundry we have chosen to specialize in handmade art and craft items made from recycled materials." Shelly and Natalie met in 1999 while working at a custom frame shop and gallery in Orlando, FL. In 2009, after an eight year run in Los Angeles, Shelly made the decision to move back to the east coast. While pondering the logistics of such a feat, she found herself desiring more out of a job than had been previously offered. The inspiration for a shop/gallery that focused entirely on handmade items made from recycled materials came out of her experience with the art and crafting scene in Los Angeles. Natalie jumped on board after hearing of and falling in love with her inspiration. Shelly and Natalie opened Foundry in the fall of 2010 after much research and business plan writing. Foundry started out clean and sparse, but over the years has found its shelves filled with recycled delights. Foundry's approach to reuse and re-imagined art has been well-received in the community. Foundry placed 3rd in the Mountain Xpress’ Best of WNC Vote for each year they’ve been open. Early this year their passion for reuse inspired a ‘How do you reuse your Laurels?’ competition sponsored by the Laurel of Asheville. "The enthusiastic response that we have gotten from patrons, local bloggers and other business owners lets us know we’re on the right path." Shelly and Natalie have built ongoing relationships with local businesses, made crafts for local non-profits, and befriended amazing local artists. Ideas for the business are ever growing, and they look forward to their future with Foundry. "As business owners we always look to connect with the community. We are constantly seeking opportunities to share and make a difference with what we do. 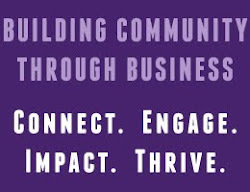 After all, Asheville is a beautiful city because of its sense of community and as small business owners we are proud to be part of that connectivity." Way to go Foundry!! Your store is a beautiful work of art and your talent and creativity is truly amazing. Couldn't think of a more deserving company for this award!!! We are honored to be a part of your store!